Ever since he was a child, Scott Poulson-Bryant, Ph.D. has been interested in the ways we create and maintain identities Now, Poulson-Bryant, an assistant professor of English who joined Fordham last year, is in the midst of his own transformation. “I’m very much into this idea of identity performance and construction,” he said. 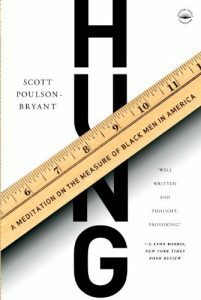 Poulson-Bryant earned his doctorate in American Studies from Harvard University in 2016, but he’s been exploring the issue of identity for the better part of two decades as a journalist. In 1993, Quincy Jones tapped him to co-found Vibe magazine, where he profiled artists such as Will Smith, Bobby Brown, Boyz II Men, and Dennis Rodman. His 1993 profile of Sean “Puff Daddy” Combs won the ASCAP Deems Taylor Award for Excellence in Music Journalism. 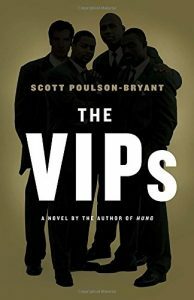 He later branched out into nonfiction with Hung: A Meditation on the Measure of Black Men in America (Doubleday, 2005) and fiction, The V.I.P.s (Broadway, 2011). “I left Brown for a year and ended up staying in New York for 15 years. I left New York for a year to go back to Brown, and ended up teaching at Fordham 10 years later, so I clearly can’t leave things,” he said. laughing. Transitioning to academia was relatively easy, he said. “I’d interviewed everybody I wanted to interview, I traveled the world, I’d gone to see U2 at Yankee Stadium with Quincy, I’d done the things I felt like being a journalist commanded me to do. In writing books, I also found a different voice that I’d built on as a journalist,” he said. Echoes of that voice live on at Fordham. In his creative writing class, Flawless/Freedom/Formation: Writing about Race and Popular Culture (Yes, that’s a nod to Beyoncé), Poulson-Bryant, a native of Rockville Center, New York, has students read his Puff Daddy profile. 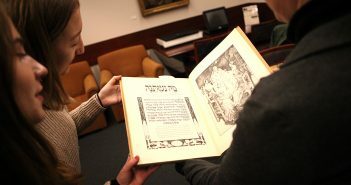 “Students don’t have to just read theory or the vaunted history texts. They should read journalism, they should read memoirs, and they should read essays,” he said. When it comes to future research, Paulson-Bryant is editing “Everybody is a Star,” with the goal of submitting it in September for publication. It was inspired in part by “The Soiling of Old Glory,” the 1976 Pulitzer Prize-winning photograph of Joseph Rakes, a white teenager, assaulting Ted Landsmark, a black man, with a flagpole bearing the American flag. 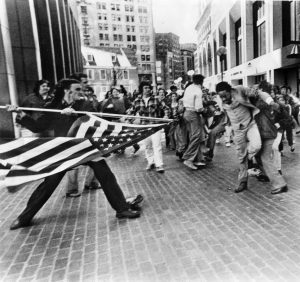 He said the image, which was taken in Boston during school busing protests, is a visual representation of the tensions that existed between white ethnics and African-Americans at the time. 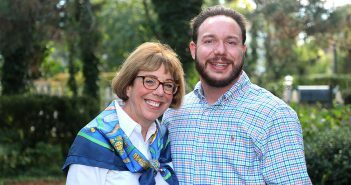 “As a kid, I remember hearing about the busing crisis and Irish kids throwing rocks at black kids in Boston,” he said. Poulson-Bryant argues that, historically, African Americans existed as both central to American culture and also marginal to it, particularly in interactions with what historians dubbed white ethnics: the Italians, Irish, and Jewish. At the same time that the series Roots was playing on television, and Blaxploitation films were playing in theaters, young generations of white ethnics were returning to narratives of heritage and the “Old Country” via films like The Godfather. “There was all this cross-racial exchange going on in a lot of these spaces. Saturday Night Fever, I argue, is as much about blackness as it is Italian-ness, if you really think about what’s going on. A text like The Wiz is as much about classic Americana literature,” he said. The title “Everybody is a Star,” refers to the hierarchies of power that can be found in these pockets of ethnicities, particularly in New York City, said Poulson-Bryant. He plans to take the summer off to finish the book. But for now, he’s enjoying his second career act as a professor.